Jane Cleland’s Josie Prescott Antiques Mysteries have a devoted following with good reason. 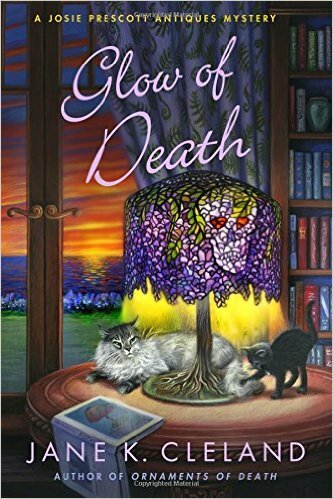 Her eleventh in the series, The Glow of Death, bring the same meticulous research and detail of the antiques world underlying the action when a rare Tiffany lamp goes missing and murder soon follows. It’s almost the Fourth of July and warm along New Hampshire’s coast when Josie called to appraise the Tiffany lamp at tony Rocky Point home of the wealthy Towson’s. Met by Ava Towson, Josie is delighted to find the lamp bears all the hallmarks of a real Tiffany lamp, along with a high value. Josie takes the lamp into her care for safekeeping and authentication, and over the next three days, estimates the value at $1.5 million–gulp. She has the film crew she works with come up to NH and film her describing her authentication process for the television show that features her, then later that afternoon returns the lamp. With her boyfriend, Ty, away on Homeland Security business, Josie is getting ready for her annual 4th barbecue when her best friend, Zoe, enlists her own boyfriend, Ellis Hunter, to help Josie with kitchen prep. Ellis just happens to be the Chief of Police, and is deep into potato salad fixing when he gets a call that Ava Towson has been murdered. With her husband on his way home from a business trip, Ellis asks Josie to identify the body. They travel to the Towson home, only there’s a catch: the woman dead in the Towson’s kitchen isn’t Ava Towson. But it sound is confirmed that the dead woman IS Ava Towson and the woman who gave the lamp to Josie to appraise was an imposter. Everything Josie has learned was based on information from this imposter, and the only thing accurate is the authenticity of the pricey lamp, and if the bit filmed for her television show is cancelled, that puts her show in jeopardy, too. Josie can’t stand the thought of being duped by the imposter, and sets out to find out who had the temerity to trick her in such a horrible way. It will bring her into the line of fire literally. One of the delights of this series is the information readers glean about the antiques world as they explore the business Josie has built, from the authentication process to the ways experts are used. A delightful addition to the series.